This article was written a few months before I graduated from Franciscan University. It was featured in the National Catholic Register. Joseph Pronechen is a wonderful man and a terrific interviewer It was a pleasure working with him and communicating something that is such a part of who I am - my passion and love for uplifting and Christ-centered music. Not once during the 13 years she studied piano in Fort Myers, Fla., did she think of composing a song — but when a friend suggested she try, Gabriela Martinez wrote a whole CD’s worth. 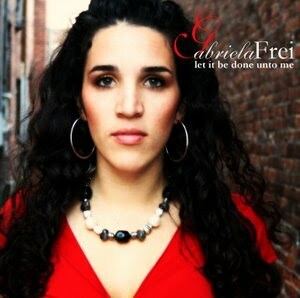 That led to the recording of “Light Unto the World,” a set of original religious songs available at GabrielaFrei.com. Today, as a 22-year-old senior at Franciscan University of Steubenville (Ohio), from where she will graduate this spring with a degree in humanities and Catholic culture, Martinez is putting together her second album. Martinez composes in a meditative, lyrical style and sings in a clear soprano. She has given concerts in Florida and on-campus coffeehouses, and acts as student group leader of the music ministry at Steubenville. She spoke about her songs, music ministry and goals with Register staff writer Joseph Pronechen. When did your interest in music begin? For as long as I can remember I always had a passion for music. My mom tells me I was singing before I was speaking. I studied piano for 13 years. That grew out of being homeschooled. My mother was very good about plugging us into a lot of different things that we all excelled in. For me this was not only classical piano but also singing. Do you have any help in composing your songs? If I think I’m going to write a song today, I can’t do it. It’s a humbling thing because I have to be present to the Lord. It’s really his work. He sits down with me and we write the song together. It’s cooperation on my part. I share with the Lord in this active writing of a song and creating a piece of music. How did your first songs come to you? I had a car accident when I was 16, and one of the songs stemmed from that experience. It’s called “Why God?” I was asking, “Why did you let this happen? Why do I experience all this pain and sorrow?” — and then realizing in the midst of the pain he’s right there with me, carrying the burden and sharing the pain, showing nothing is too hard to handle. A lot of my music has grown from the experiences through which the Lord has taught me something. And a lot has stemmed from experiences I have had on my walk with the Lord and the words that he has spoken to my heart that have been a grace and blessing to me. Your songs are quite personal in their details yet universal in their themes. They spring from my heart and the encounter with the Lord in the depths there. It’s a vulnerable thing because I share the deepest parts of my heart with others. In a lot of ways, these are the words he has spoken to my heart, and I can’t keep them to myself. They’ve been a blessing to me, but I have to share them with the world, to keep speaking the good news of peace and joy. The Lord stepped in and wrote the song along with me, knowing exactly what I needed to hear and continue to need to hear. He’s doing the work of perfection and transfiguration with me every day. What are your favorite subjects and themes? Trust, surrender, abandonment to his love. “The Present Moment” grew out of my experiences studying in Austria. It was a semester in learning how to surrender, especially from my need to have a plan with all the ducks in a row. The Lord used that semester to teach me how to abandon myself entirely into his hands. We can make plans for five years down the road, but the gift the Lord has given us is this moment right now. We have to surrender the need to have it all figured out. We have to trust in the Lord and know whatever he has planned for the future is perfectly suited for us. Your two Marian songs bring this out, too. What’s the story behind “Fiat”? I wrote that song after my family had the blessing of going on a pilgrimage to the Holy Land. While I was there I meditated mainly on the union between the Sacred Heart and the Immaculate Heart — “Not my will but yours be done” in the Garden of Gethsemane, and “Let it be done to me according to your word” at the Annunciation. In the last part of the song I’m asking both Our Lord and Our Lady to help me have the ability for that same Yes, embrace it and accept that mission or role, whatever it is, because nobody else can do the work only I can do. That applies to everyone. Tell me about your pro-life sno that has moved listeners. The mother doesn’t want to give up her child, and the little one is crying out, too. We live in such a culture of death that more and more is ready to hear this message of hope and life. Tell me about your music leadership at Franciscan University. There’s no more beautiful use of music than in the liturgy of the Mass. I try to do a blend of the traditional hymns and the more contemporary praise-and-worship songs. I came from a more traditional church back home, but I also fit into the praise-and-worship [category] because my family has had a charismatic prayer group for as long as I remember. I would like to see what opportunities and doors the Lord has for me to walk through. I would love to sing full-time and keep writing and recording and develop a ministry to hurting hearts to let them know the Lord is waiting to shower his love on them. There can be no greater blessing than doing what you love for who you love.